Our next Stammtisch will be on July 17, 2015. We will have mockups of the first colouring book (binder with artwork organised before I send the file to the printer) for comments. I will talk about deadlines for various book projects and I will take suggestions for the series of colouring books. 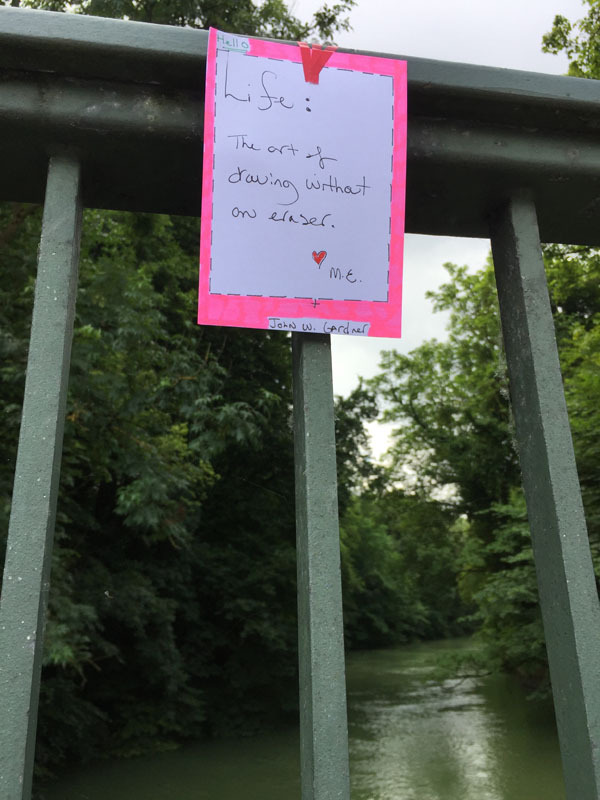 The second book will be dealing with street notes left around Munich. If you want to participate in this, you better get cracking! I posted the #letsplayagame on Instagram. Do you follow our Instagram feed? The game is to print the photo I’m posting online and then tape it somewhere in the city and snap a cool photo. I don’t care if you leave the image there or take it home with you. I’m interested in the photograph you snap. Please if you play this game and send me a photo, you must give me permission to print it for commercial use. It must state this specifically in the email you send me or I will not use it. The third book subject is up for grabs. I want these books to be coming out each month starting sometime in August. The books will be a hybrid “bookzine” because we are making them print by demand and I don’t want to date the content. I was thinking it would be fun to have an Oktoberfest book for September. What do you think? We are organising an art event for November 15th (tentative date). I’m submitting the request this week to see if we can secure the location for the event/exhibition and get Munich’s blessing and cooperation. Think Stand for your Art but 10x as many artists and no standing but lots of opportunities to have fun which should clarify nothing which is the point… I don’t have permission yet so can’t go into details. (Because of the size, there will be a cost between 100 to 300 Euro per artist.) We will be making a book from this project and we will have a dedicated website where all participating artists will be showcased. These are not paid jobs…. just like me, you will be wearing a volunteer hat. If we get enough sponsorship, there may be some compensation but you can’t take on these roles thinking about that. It will be really cool and hopefully we will be able to repeat this kind of exhibition on a yearly basis and attract the sponsors we need to pay you for your time. The event will be juried by artists. I will be asking established artists to take on this role. Those artists will automatically be included in the event. You can suggest an artist you respect to be one of the jury members. I will select the list of artist jury members to be involved by the end of July 2015. Tomaten auf den Augen haben. A more detailed explanation which is being sent to the city will be posted here. Once our idea has been approved, we will be making an open call for artists to exhibit for the event. Because it is being juried, please do not be upset if your artwork is not selected. You are welcome to participate in another way. We will have workshops & participatory art as an integral part of this event and will need artists who love to deal with people interacting with the public. You can hand them as many business cards as you want as long as they don’t end up in the art projects. We will discuss the idioms on July 17th, how many we should have because this will determine how we organize the artwork. Also, I need feedback about the location (which will be announced one we hear back from the city). We are submitting our application this week but I need to know how much “work” an artist is willing to do for a one day event or if they are willing to pay for security to make it a two day event. (Sat/Sunday) Once we have city approval, I can give more information about the exhibition. For now, please reserve July 17th for the planning meeting “Stammtisch” and November 14 and 15 as the tentative date(s) for the event ( Saturday/Sunday). Have a Great Monday. A newsletter shall soon be following. Next PostLet’s play a game – bored?